Do We See Jesus at Work in Our World and in What We Do? HomeBlogThe BibleDo You See Jesus? After Jesus is executed and rises from the dead, he appears to two of his followers as they walk down the road, but they don’t recognize him. They don’t see Jesus. Yet he listens as they talk about him. He pretends to not know about the events they’re referring to, and he asks them to explain. They eagerly do so. After they fill him in about the hoped for savior who was crucified, Jesus begins teaching them. He connects Old Testament prophecy with how he just fulfilled it. When the pair reaches their destination, they ask Jesus to stay with them. He does. At the meal Jesus breaks the bread, thanks God, and passes it to them. At last they recognize him, they see Jesus, but then he disappears. The two remark about how he deeply touched their hearts and engaged their minds as he talked with them and taught them from the Hebrew scriptures. While it is easy to criticize these two for not recognizing their friend Jesus, I wonder how often we are guilty of the same thing. 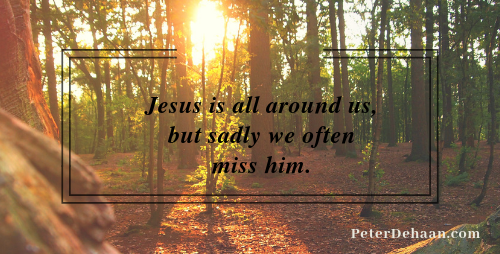 Though Jesus may not physically appear to us as we go for a walk, I suspect he is all around. Jesus can show up in the things that happen to us and the people we meet. His Holy Spirit guides us and directs us. We receive spiritual insight and wield supernatural power through Jesus. Yet how often do we miss this? Jesus, give us the ability to recognize you. Let never miss out on seeing you again. May we see Jesus everyday.